The story of the Fourth District Agriculture Fair, from the first one held in September 1867, to the one this year (1955) is a story of continued growth and expansion. 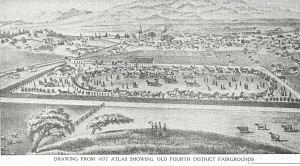 (For example) The first Fair in this locality… under the auspices of the Sonoma County Agriculture Society, was held at Straubville at the intersection of of the Middle Two Rock Road and Bodega Avenue. A pavilion was erected and ground enclosed as a spacious track for exhibition and trial of stock. May 1868: This fair was held at the new fair grounds, located on Fair Street, where the present high school building now stands and fairs were held there until the formation of the Fourth District Agricultural Association in 1880. 1877: The pavilion was enlarged, by extending the west wing 40 feet. A large number of stalls for horses and stock were built, and the whole grounds were overhauled and repaired. 1878: The grandstand was enlarged by one-half its former size, trees were also planted. One hundred acres were selected on the eastern edge of the city, a mile track was graded put into excellent condition and the pavilion, grandstand and other moveable buildings from the old grounds were put up. Several acres of shade trees were planted. 1910 -1911: Fred Wiseman made flights from Kenilworth Park race track. 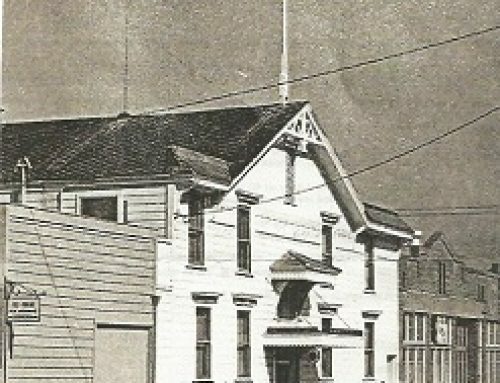 1935-36: After Mr. Stover’s death the City of Petaluma purchased Kenilworth Park and in 1935 the Fourth District Agricultural Association was once again revived and in 1936 the first fair was held at Kenilworth Park. 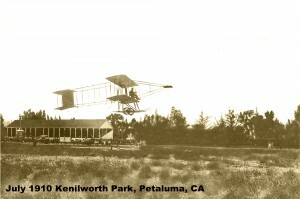 Conclusion: The photograph of Wiseman’s plane in the previous blog (Part II) was definitely taken in Kenilworth Park, Petaluma, California.